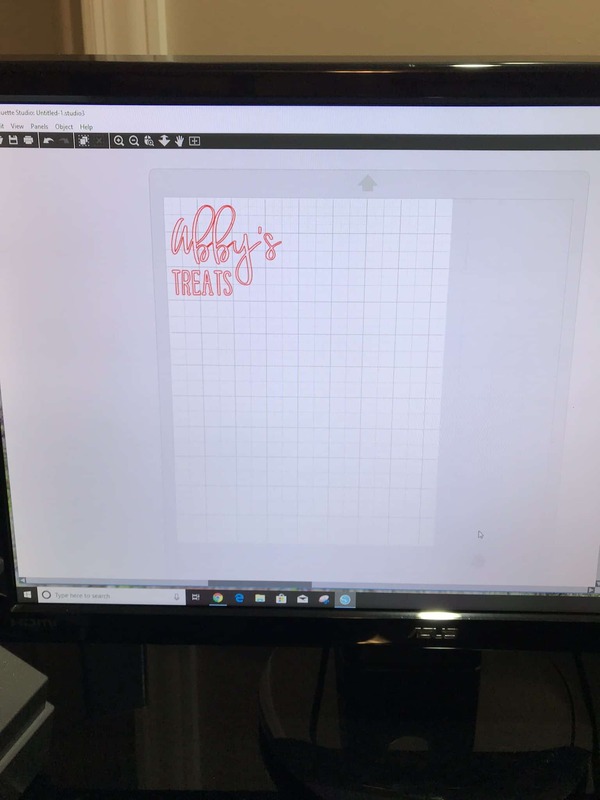 Adam bought me a Silhouette Cameo 3 for Christmas and I cant get enough of it. I’ve been putting vinyl decals on just about everything. 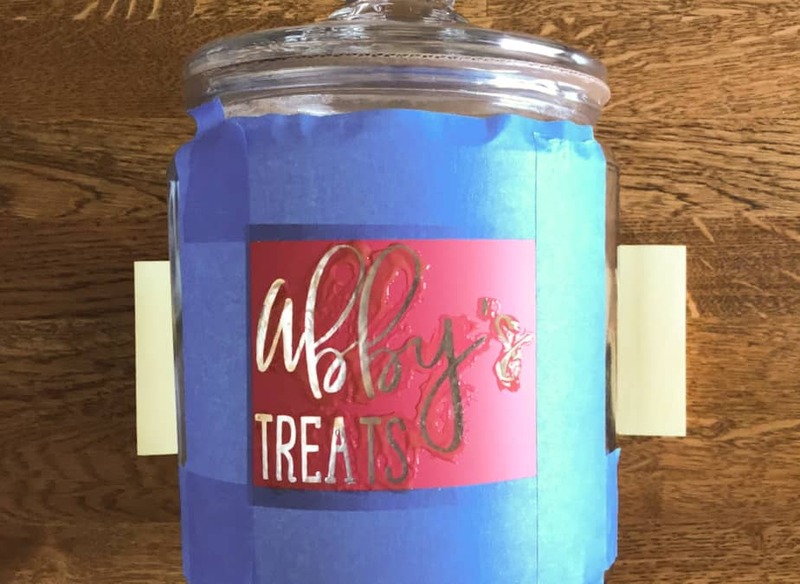 Today I made a super simple personalized dog treat jar. My original intent was to do an etched glass design (which I tried). 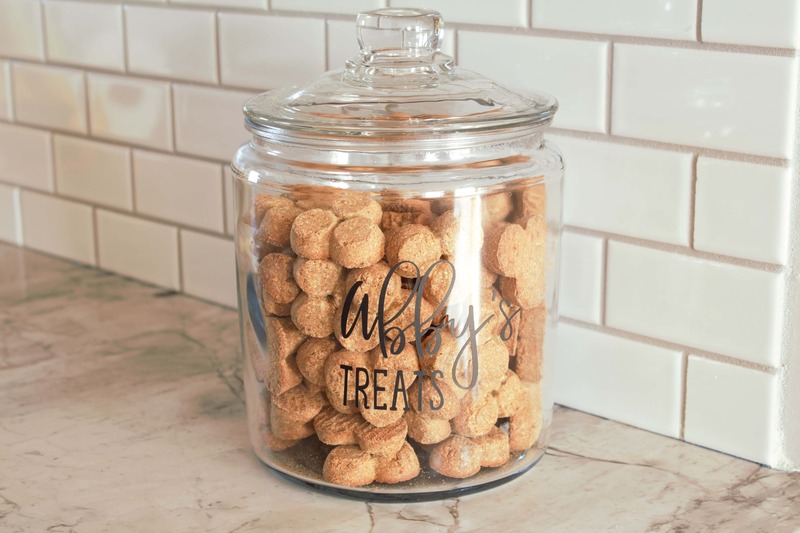 It turned out ok but once I put the treats into the jar you couldn’t really read the words anymore. So I went with my backup plan of just using a matte black vinyl decal. 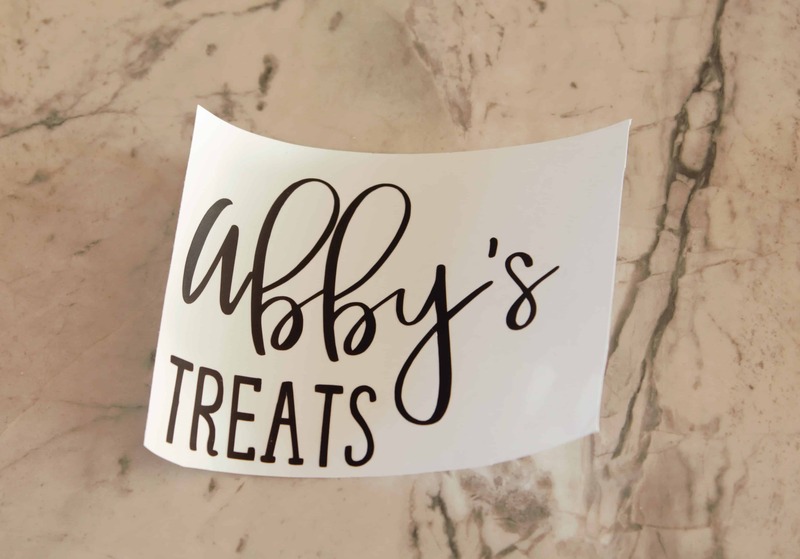 Before we get into the tutorial, I’ll share with you where I’ve been storing Abby’s treats. Yup, an ugly disposable lunch meat container. It’s always been an eye sore so I either despise looking at it or I put it in the cabinet when people are over and then I totally forget to get it back out and give my poor girl her daily treats. 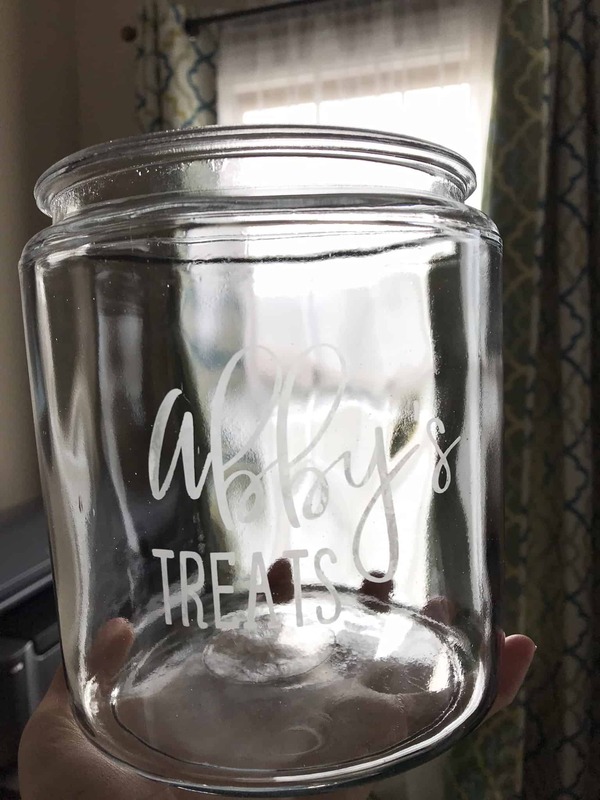 So to solve that problem I bought a simple glass jar and used my Silhouette to personalize it. This post contains affiliate links, meaning, at no additional cost to you, I will make a commission if you click through and make a purchase. Thanks for the support! Since I tried two different methods, I’ll break them out to show how I did the matte black vinyl words and also how I did the etched glass. Design your text in your software program. Since I have a Silhouette Cameo 3 I use Silhouette Studio. I wanted a mix of hand lettered font and some more traditional font so I went with Caroline for the the top and Farm Fresh for the bottom. 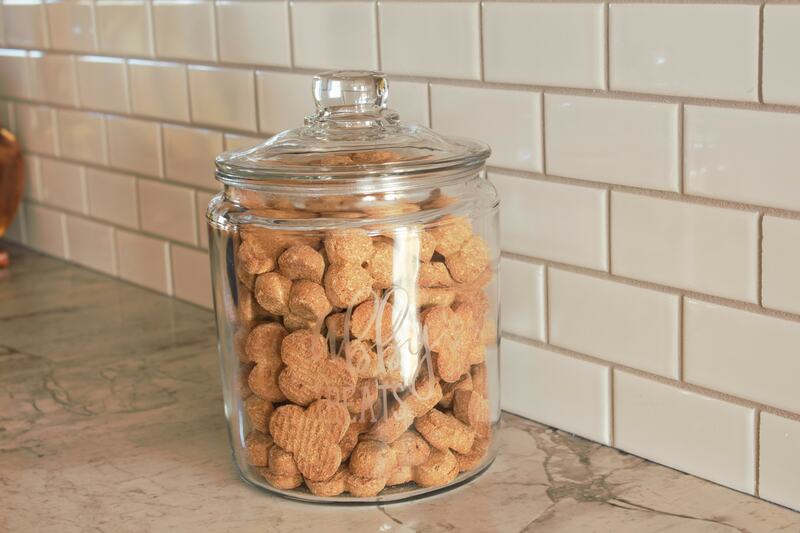 Make sure that your design fits well on your glass jar. If it’s too big and wraps around you might not be able to read it. 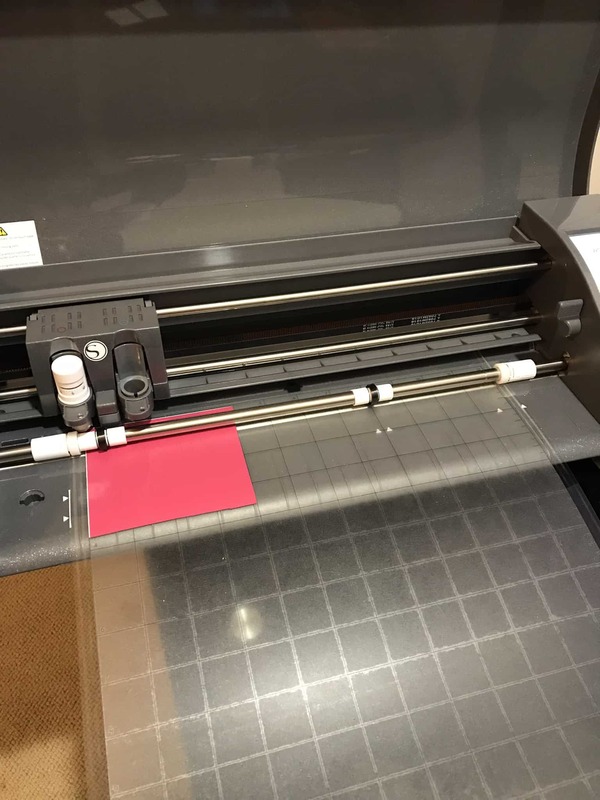 Cut out your design using your vinyl cutting machine. Weed out your words. For this step you’ll either want to remove the words or the background. 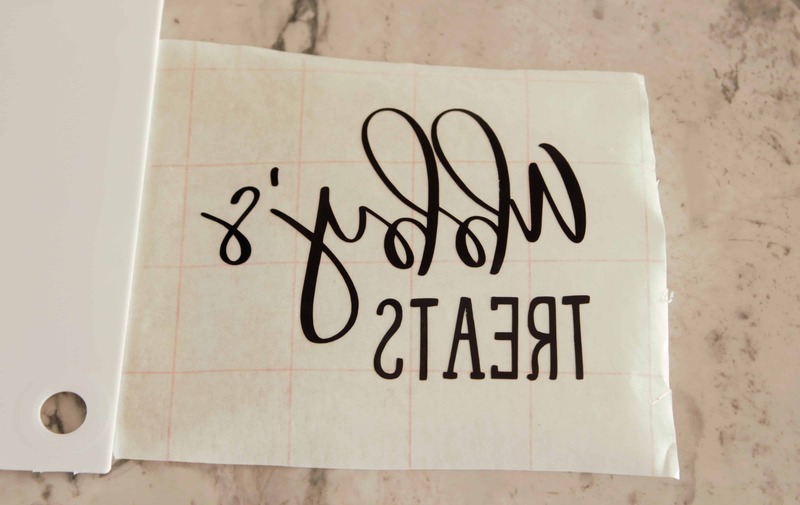 It all depends on whether you are using the vinyl for the words or if you are creating a stencil to etch the glass. I used pink vinyl for the glass etch version since I was only using it as a stencil and the color didn’t matter. On the vinyl word version I used matte black vinyl. 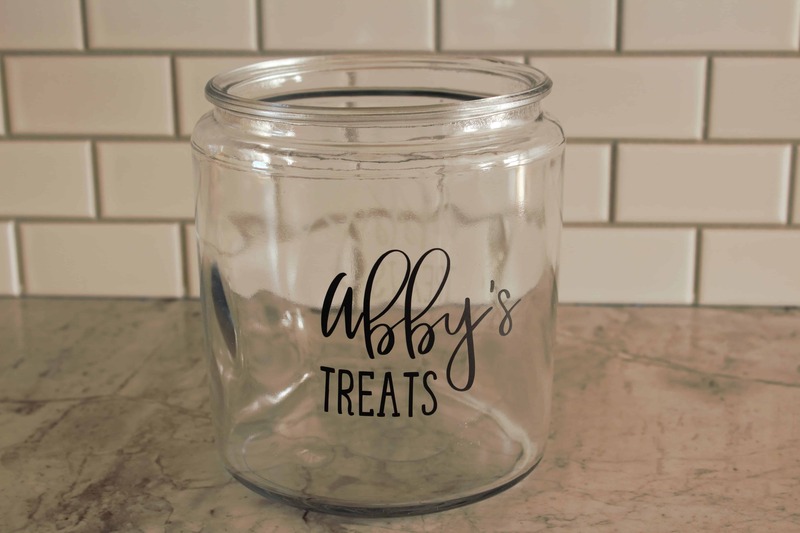 Use transfer paper to transfer the vinyl design onto the glass jar. Below you will see how I did it with the black letters. 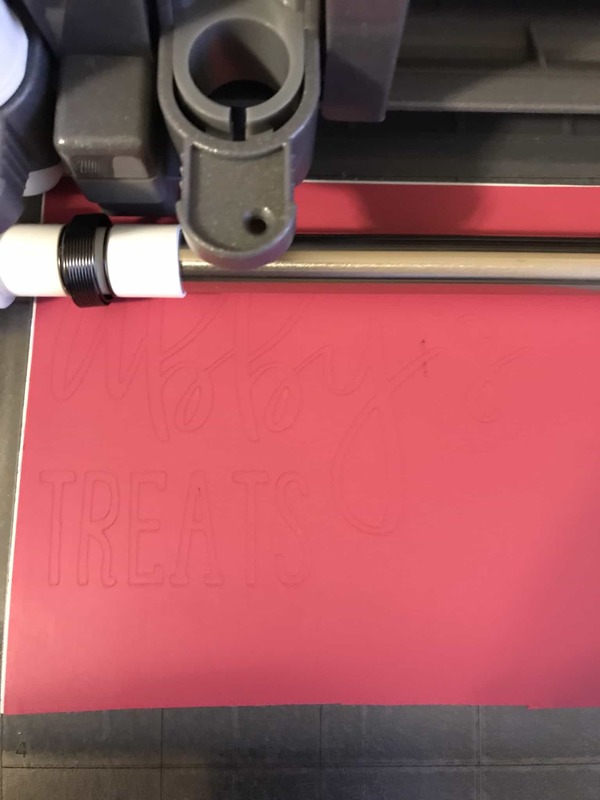 Note that this process was no different with the etched version. That was the last step if you’re using the vinyl as the letters. Now, if you want to etch the glass, keep scrolling. To etch the glass, apply the vinyl stencil to your jar. 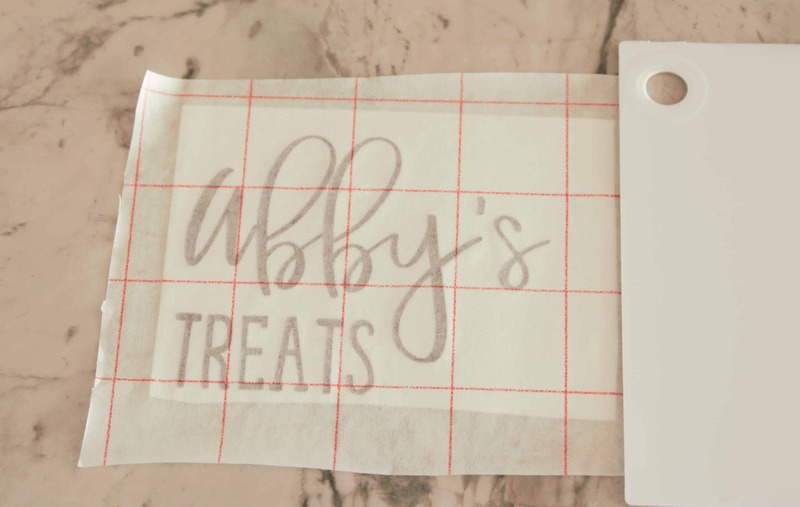 Then, use painters tape to tape a border around the stencil. This is to avoid getting any of the etching cream on the glass where you don’t want it. 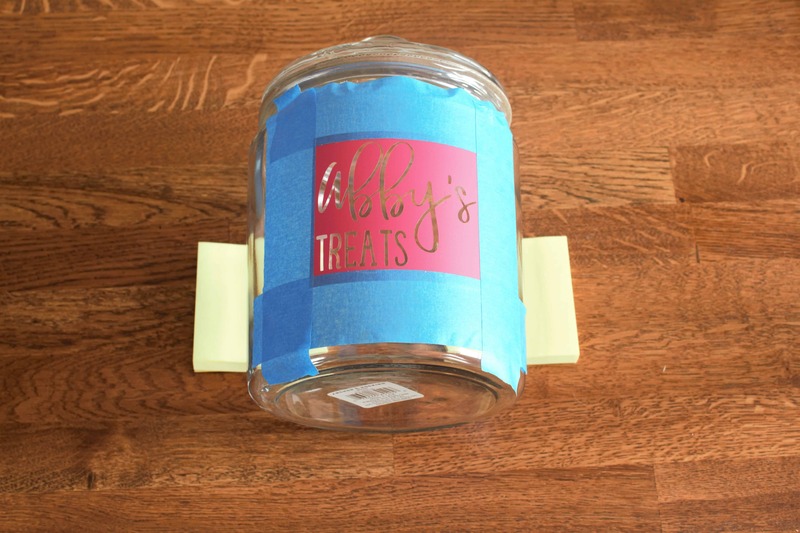 I used two stacks of post it notes to hold the jar in place so that it didn’t roll. Follow the directions on the jar of etching cream that you purchased. For mine it said to apply a generous layer of etching cream and allow it to sit for 15 minutes. Then, after 15 minutes wash off the excess etching cream with water. Please also be sure to follow the safety instructions on the jar/bottle. This stuff is pretty serious. In the sunlight and with nothing in the jar it’s fairly easy to read. See below for example. However, once I filled it up with treats it was pretty difficult to see the words. If you’re looking for something subtle then this might be exactly what you want. However, I wanted something a bit more noticeable which is why I went with my backup plan of matte black vinyl words. The first photo below is the finished etched glass version. The second image is the black vinyl. I didn’t actually make two jars, I just put the black vinyl on the opposite side of the etched words ;). I’m happy with how this project turned out. 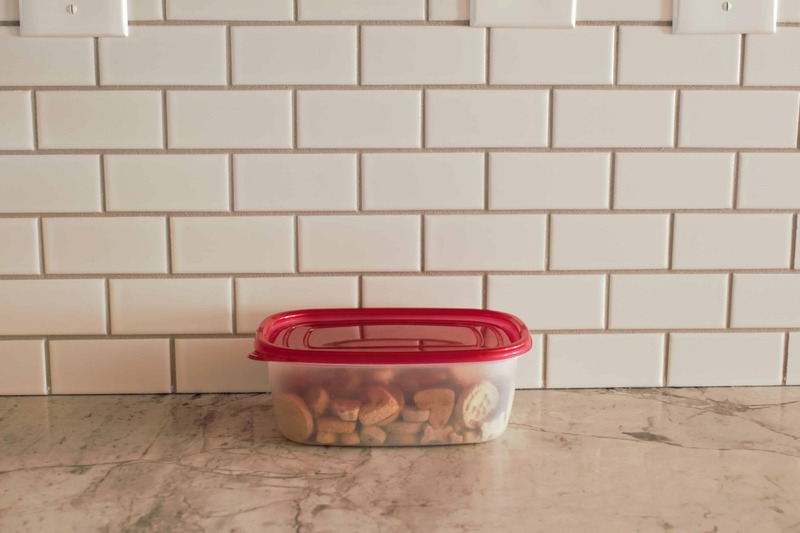 My counters look more presentable now that the disposable lunch meat container of treats is gone. 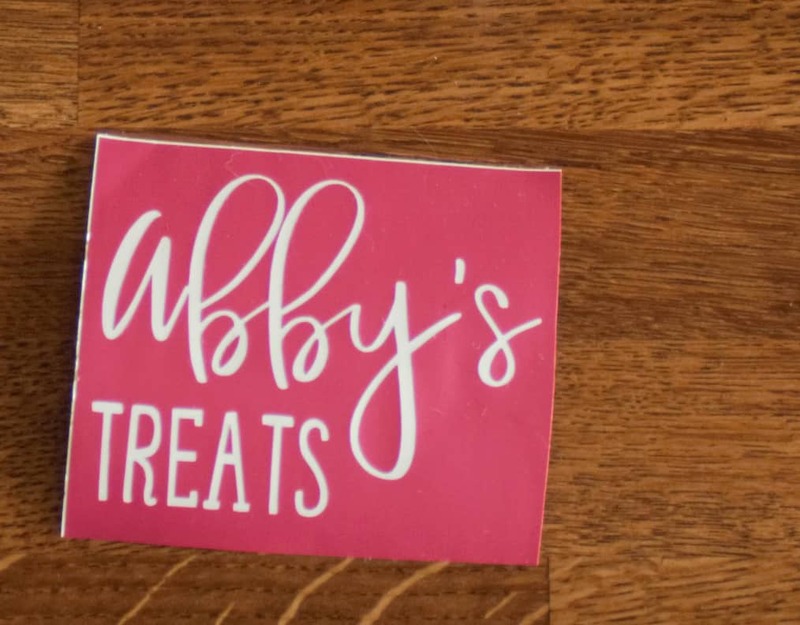 And now I can leave Abby’s treats out all the time and never forget to give her some. She’s going to need more walks in the future for sure! If you would like to save this post for later you can pin it below. Thanks for reading. 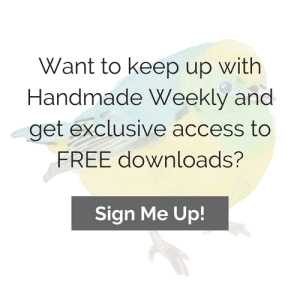 Please follow me Follow me on Instagram Pinterest and Facebook to see what I post each week. 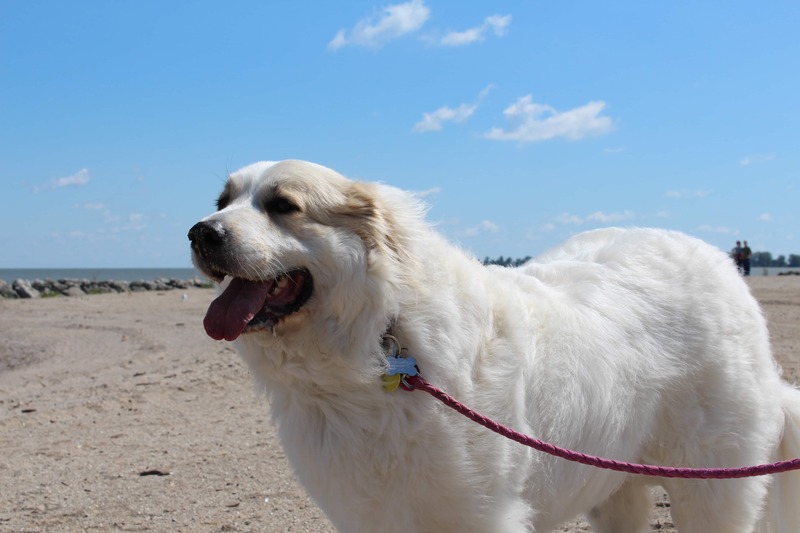 You didn’t think that I was going to do a whole post that is dog related and not include a picture of Abby did you? Haha, I can’t resist. Just look at that cute face! 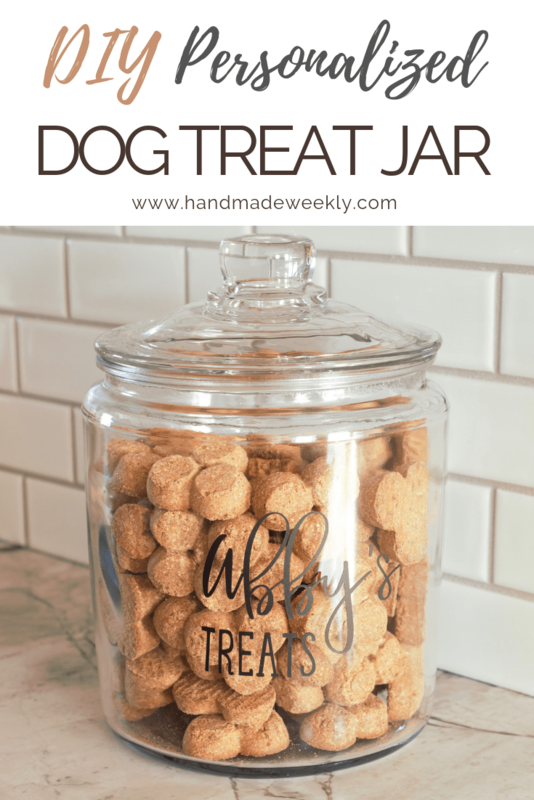 You may also enjoy my recipe for Soft Chew Dog Treats.